Mr. Richardson and Dr. Cosad joined resources to make the most of three adjacent lots on Trinity Park. 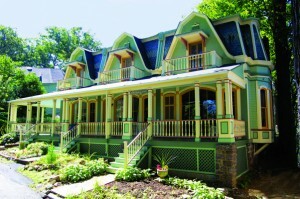 When the treble cottage was completed Dr. Cosasd occupied the upper residence (left half of No. 32), and the center unit was purchased by Rev. Craig, Presiding Elder of the Jersey City District of the Methodist Church. “Architecturally this treble cottage is one of the prettiest buildings on the grounds, and its very appearance denotes taste and refinement. It is ornamented by a French roof, bay windows, and plate glass door[s], and is in every essential a beautiful place of residence.” (1877) Note the large plate glass windows across the front of the building-an unusually striking feature for its time. The house originally had a second story porch on the front and decorative vergeboards under the eaves. The middle and upper cottages were converted to a single residence in the 1950s. No. 32 Trinity Park is the only cottage in Mount Tabor which has never been sold. It is owned and occupied by a descendant of J. Smith Richardson. 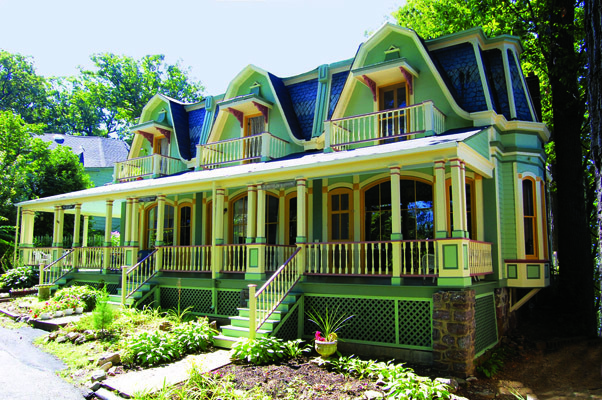 Note the distinctive mansard (“Second Empire”) roof with a pattern worked in multi-colored slate. At the back of the structure, from Wesley Place, can be seen original detailing in brackets, post supports and remaining sleeping porch.